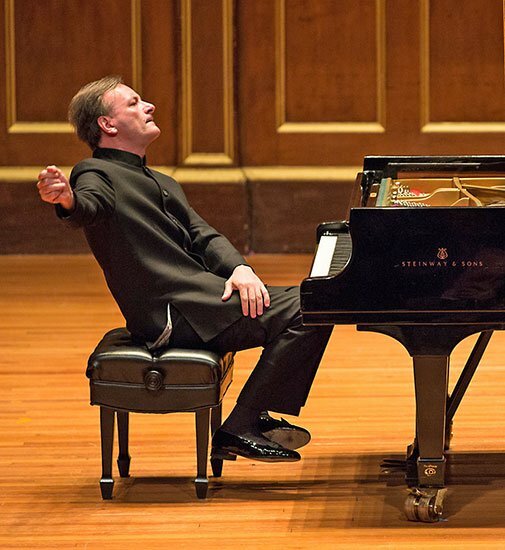 Friday night saw Stephen Hough at the keyboard in Jordan Hall. Summoned by the Celebrity Series of Boston, he led a tour of impressionism by Debussy and Chopin with mastery, insight, and passion. The recital sandwiched Chopin within Debussy, reversing chronology as it created a narrative of thematic insights and showed the intimacy of compressed expression deriving from earlier public, expansive compositions. Debussy’s La plus que lente, l. 121 opened in a thoughtful rendition played with delicacy, beautiful phrasing, and a fabulous sense of proportion. In three pieces from Estampes, l. 100, “Pagodes,” “La soirée dans Grenade,” and “Jardins sous la pluie,” Hough demonstrated the judicious use of varied touch, making of the piano a guitar or varieties of rainfall; he capturing the essence of these prints. Later, in Children’s Corner, l. 113, we heard playful perfection. In L’Isle joyeuse, l. 106 which followed, Hough balanced sensuous pleasures and dramatic landscapes in taut musical architecture. Debussy’s placid surfaces often conceal profound depths. Hough captured this tension throughout. If in Debussy surface tensions constrain the seething, in Chopin’s Ballades the music overflows its vessel. Ballade No. 2 in F Major, Op. 38, alternates between calm and agitated while Ballade No. 1 in G Minor, Op. 23, captures the manic irruption of folk music into a sea of tranquility. Ballade no. 3 in A-flat Major, Op. 47, ranges from flowing to stormy, expressing watery power in all its guises. Ballade no. 4 in F Minor, Op. 52, is a study in nostalgia, capturing Chopin gazing wistfully back to his native Poland. All four ballades are linked, rightly or wrongly, with poems by Adam Mickiewicz; like poems, their logic proceeds by selecting and linking equivalences rather than subsuming them to the logic of contiguity. Varied gestures brought into conversation tell a story, and Hough is a masterful storyteller. The formal program finished, Hough offered up four encores: Chopin’s Nocturne in F-sharp Major, Op. 15 No. 2, continuing on from the body of the recital yet shifting the mood to a more relaxed and meditative vein; Dulcinea Variation, Hough’s own arrangement of music from Minkus’s ballet Don Quixote, presented lovely dreamlike ballet music with lustrous sheen and internalized passion; Hough’s “silly little piece” (as he called it from the stage), Osmanthus Romp, is a delightful breakdown of piano technique in the spirit of honky-tonk; Grieg’s “Notturno” from his Lyric Pieces, Op. 54, No. 4, a counterpoint to the Chopin Nocturne, made of these four encores a coherent set and a prayerful culmination. We were truly looking forward to hearing Stephen Hough, but were somewhat disappointed in the amount of “banging” he did (perhaps especially because we were in the second row center, but it can’t be only that….). An interesting program, certainly, and he’s an impressive technician who seems to be looking for most of the right things. Going for the jugular in the fast, demanding passages compromised accuracy, which seemed to matter at those extreme dynamics. For me, in general Debussy fared better than Chopin, and I thought the Globe review was perhaps a bit harsh, but often right on the money.